Teri's World with Harley: Vivian Wang,an amazing artist in touch with her inner child. Vivian Wang,an amazing artist in touch with her inner child. Our friend Vivian is a sculptor. Her work is fresh, detailed, colorful, and alive. It had been several months since we had seen Vivian and Andy and I had heard she was selling more work than she could produce. When we met at a party a few weeks ago we started talking about how she gets new ideas and keeps her work fresh. She said we must come and see the changes to her studio. Vivian’s work is an integral part of hers and her handsome husband Andy’s life. The sculptures in progress are worked on in their large bright kitchen, a beautiful work space. One series she calls Invisible People have glass faces, or hands, or feet depending on her vision for the piece. She explained how she and her assistant make the molds for the glass pieces and showed us the new kilns used to fire the pieces which takes from start to finish 3-4 weeks. The clothing her people wear is beautiful. Vivian was a fashion designer in New York City for many years before she and Andy retired to West Palm Beach. Her eye catches the flow of the garments, where there are pressure points, and tension from bending or reaching, looking at the fabric flow through her eyes was an inspiring experience. In many pieces the print on the clothes is complicated and that must follow the same rules as garment flow. 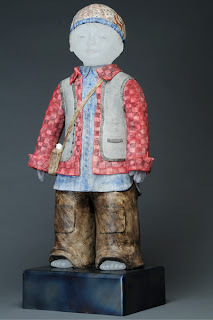 It is funny to hear her talk about her creations they are little people she is sending off to create joy, inspire conversation, and have an honored place in their new home. 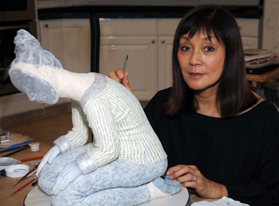 It looks like Vivian’s retirement hobby and passion will keep her busy as she brings her glass and clay to life. You don’t have to worry about Vivian getting burned out she just doesn’t feel any pressure to produce work. The gallery just adds clients name to a list and tells them they will have to wait. After all this is her hobby and she loves creating this beauty. I don’t have the creative talents Vivian has, I am inspired by her beautiful work and wanted to share a little of her story with you and her amazing work too.